It has been several years since I stood before Caravaggio’s Supper at Emmaus in London’s National Gallery, but I remember the experience well. I was with my husband. Having recently completed our own journey overseas, we both were struck by Caravaggio’s portrayal of a journey, or at least the end of one. The painting shows the two disciples in the Gospel of Luke who, after the resurrection of Jesus, travel from Jerusalem to Emmaus, where they encounter the risen Lord (Luke 24:13–35). Theirs was a journey of sorrow, since they believed their friend and teacher to be dead. It was also a journey of mystery. On the way, a stranger joined the disciples and burned their hearts with talk of the prophecies concerning Jesus. Upon being invited to dine with the disciples in Emmaus, the mysterious traveler revealed himself to be the resurrected Lord when he broke and blessed the bread. Caravaggio revels in the moment of revelation. In his painting, Jesus holds out his hand in blessing while the two disciples react violently to his presence. The disciple on the right spreads his arms wide in surprise (a gesture of crucifixion come to life), while the one on the left seems about to rise from his chair. Strong light rakes the scene, creating deep shadows and plunging the face of an uncomprehending servant into darkness. With characteristic drama, Caravaggio interprets this scene of revelation as a cathartic event, one that releases the pent-up emotion the disciples must have been feeling. He shows us the shocking and gratifying outcome of a journey, physical and emotional, in which all was believed to be lost. This painting, as I mentioned, caught our eye—and burned our hearts. In the silence of the gallery, I turned to my companion and whispered, “Look.” We reveled for a moment in Caravaggio’s revelation. This is what the Supper at Emmaus makes viewers want to do, so palpable is one’s relief in discovering, with the disciples, that Jesus is not dead. The cathartic experience of encountering Caravaggio lies at the heart of The Other Side of You, the fourth novel by British author Salley Vickers (Farrar, Straus and Giroux, 2006). In this book, two people discover Caravaggio and forever are changed. The Supper at Emmaus itself forms the centerpiece of a journey on which they embark together, one that, like the story Saint Luke tells, begins in loss and ends in hope. Vickers leans heavily on Caravaggio to tell this tale. The Italian master lends his trademark drama to her more subdued style, and the prominent role played by his Emmaus painting makes the novel not only a good story, but also a powerful reflection on art as revelation. The story ends, in fact, with a revelation about the role of art in our lives. 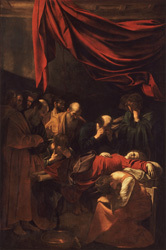 Through the experience of her characters, Vickers suggests that Caravaggio’s paintings, if we take the time to engage with them—to see them, revel in them and retell their stories—might send us on a journey of our own; a journey not just to the museum, but one in which we can recover, with the Emmaus disciples, all that has been lost in our lives. In The Other Side of You, we meet Elizabeth Cruikshank and David McBride, the survivor of a failed suicide and her psychoanalyst. Both have suffered losses in their life. 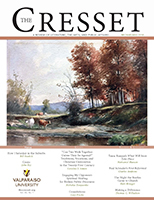 Elizabeth, through a combination of her own mistrust and more than her share of “foul luck,” lost the person she loved, an art historian named Thomas. David, the narrator of the story, ostensibly is there to help Elizabeth in the aftermath of her suicide attempt. He does, but in the process reveals his own brokenness; we learn early on that he lives in the shadow of his brother’s death in a childhood accident. Patient and analyst both seek healing from the losses that haunt their lives. A painting gets them started. When Elizabeth first meets with David, she cannot—or will not—reveal the events that led to her attempt on her life. One day David notices her looking at a painting on the wall of his office and asks if she likes art. When Elizabeth grudgingly admits that she used to like Caravaggio, David goes to see the artist’s Supper at Emmaus in London’s National Gallery and falls in love with the painting. Elizabeth and David’s mutual admiration for Caravaggio creates a space in which Elizabeth is able to tell her story. In the course of a seven-hour session, during which they drink “tankerloads” of coffee, the two begin a journey of healing. As they talk, the Supper at Emmaus informs their conversation and becomes a road that they travel together. This is what art is supposed to do. Great paintings prey on us; they weigh on us; they will not let us go. Even when made in other times for other patrons, it sometimes seems as though they were made with us in mind. This is certainly true of Caravaggio’s art, as is indicated by my own experience in the National Gallery. His paintings stay with us. They reach out and make us part of a story whose message touches our lives. In the Supper at Emmaus, the disciples cannot help but react to the revelation of Christ. Neither can the viewer. The painting’s setting is minimized and the action pushed to the front of the picture plane, almost into our space. We have to get out of the way of the two disciples lest we get struck by a hand flung out or a chair pushed back. We may be called upon to catch the basket of fruit that is about to fall off the table. Finally, amidst all this action, we recognize the force that is causing it. Discovering the presence of Christ, we share in the astonishment of the disciples and forever are changed. The Supper at Emmaus effects profound change on Vickers’s characters. The painting pulls them in, its theme of revelation paving the way for their own self-disclosures. After David admits his newfound love for the painting, Elizabeth begins to talk about the person she loved: Thomas, who was a Caravaggio specialist. She speaks about meeting Thomas, loving him, mistrusting him, and, finally, losing him. Her story, in turn, prompts David to reflect on the death of his brother. As the two characters delve into their past, their stories are interwoven with their impressions of Caravaggio and their memories of seeing his paintings—not just the Supper at Emmaus, but others as well. They take an intensely personal journey through Caravaggio’s oeuvre. David’s “light of the mind” is like a Caravaggio painting—full of cast shadows. This passage recalls works like the Supper at Emmaus, in which we see a textbook example of Caravaggio’s chiaroscuro, the play of light and dark. In the Emmaus painting, the shadows that at first seem to hide parts of the scene perform a revelatory function: they invite viewers to peer closely at the painting, perhaps discovering something they otherwise might have missed. If David’s mind is like the Supper at Emmaus, we might identify Elizabeth with the figure of the servant, whose face is in darkness and who does not yet understand the revelation taking place before him. A second allusion to Caravaggio’s chiaroscuro appears later in the book, when Elizabeth, sitting in David’s office, first reveals her admiration for the Italian master. As Elizabeth begins to speak, David notes that “the light was partly obscuring her face—I should really have had blinds but I hate to keep out the sun” (32). In this scene, immediately before Caravaggio makes his appearance in the story, Elizabeth moves into the light. Although it partly obscures her, it also hints at clarification. With Caravaggio’s help, Elizabeth soon will tell her story. Her journey of healing is underway. The two passages that evoke Caravaggio’s famed chiaroscuro occur early in the book, before any of the artist’s paintings are mentioned. They are bits of foreshadowing that announce the novel’s theme of revelation: as shafts of light pierce the darkness in Caravaggio’s paintings, so Vickers’s characters slowly are illuminated. As the plot advances, and Caravaggio becomes important to the story, these characters begin consciously to identify with his paintings. They each are likened to a key Caravaggesque figure that defines them and travels with them on their journey. Perhaps the most poignant identification concerns, again, Elizabeth. After she relates her tale of love and loss, which ends with the death of Thomas, Elizabeth bows her head. At this point she reminds David of the grieving Mary Magdalene in Caravaggio’s Death of the Virgin. In this painting, the Magdalene sits beside the Virgin’s body and bends over, her face obscured. Her hair, bound atop her head, resembles a crown of thorns. Once a shadowy image in David’s mind, Elizabeth now assumes a place in a specific Caravaggio painting—one that was rejected by the clergy for whose church it was painted because of its brutal portrayal of death and grief. Elizabeth herself tells David that when she saw this painting in the Louvre, she looked at the Magdalene and thought, “Yes, I know how you feel” (144). Toward the end of the book, David becomes, in his own eyes, part of Caravaggio’s oeuvre. He travels to Rome and contemplates Caravaggio’s David with the Head of Goliath in the Borghese Gallery. The biblical David gazes at the severed head of his enemy with something like remorse. 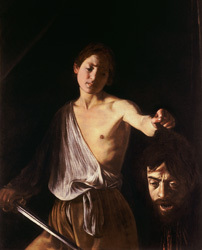 Viewers of this painting often take gruesome delight in the fact that Caravaggio apparently gave the head of Goliath his own features. But the character of David is drawn to the face of his biblical namesake. In the course of his session with Elizabeth, David has come to believe that he played an unwitting role in his brother’s childhood death, and he sees himself in the brooding image of a boy who has killed. This disturbing identification ends with a glimmer of hope. Recalling the rest of the story, David acknowledges that Caravaggio’s troubled boy went on to become a great and powerful king. Hearing this reflection, the reader believes that the character of David also will go on. More than anything David states directly, his thoughts on the painting tell us that he is on the road to healing. This narrative technique appears repeatedly in The Other Side of You. Caravaggio’s paintings, placed at key points in the story, mark stages in the characters’ journeys and reveal their emotions. The paintings are revelations. They accompany David and Elizabeth on their own road to Emmaus, where they forever will be changed. The Other Side of You also takes readers on a journey. 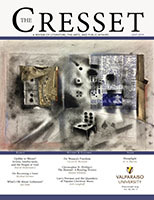 As the novel’s plot advances, we encounter a series of Caravaggio paintings—from the Supper at Emmaus to the Death of the Virgin and David with the Head of Goliath—as if we were strolling through a carefully organized gallery or exhibition (three more Caravaggios—a second Supper at Emmaus, the Calling of Saint Matthew, and the Conversion of Saint Paul—also make an appearance in the novel). We walk through this gallery with Vickers’s characters. As they discuss Caravaggio, they bring his paintings to life and give us insight into the Italian master’s art. With this passage, the mirror of Caravaggio’s paintings is turned onto the reader. David’s mention of “all our acts” invites us—all of us—to identify what we might have in common with the Italian master’s scenes. Our journey through a Caravaggio gallery becomes a journey in which we see our own life reflected. 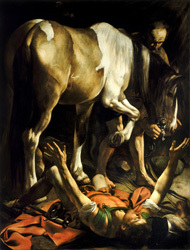 As mentioned above, Caravaggio employs an arsenal of techniques to involve viewers in his painted scenes. He hides figures in shadow and makes us peer closely to find them; he makes his figures break the picture plane separating painting and viewer; he makes objects nearly fall into the space at our feet. Caravaggio also gets personal. He paints ordinary people and makes us wonder, as David and Elizabeth do, if he really is painting you or me. Bellori’s concern has some validity. Caravaggio refuses to cast his figures, even the biblical giants, as heroes. He uses people off the street—perhaps people like you and me—as models, and he captures them in moments of grief and helplessness. His David is not triumphant but troubled. His Virgin Mary will not rise from her deathbed, nor his Magdalene raise her grieving head anytime soon. Likewise, when Caravaggio painted the Conversion of Paul, he did not portray a saint who saw a glorious vision; instead, he depicted a man who falls off a horse and sprawls awkwardly on the ground like an overturned turtle that cannot right itself. This can make for difficult viewing because most of us would rather play the hero—or at least play the role of someone who has her act mostly together. To see ourselves in a boy who has killed his first enemy or a haggard woman bent over with grief can wreak havoc on our sense of self. It simply is not comfortable to see the truth of who we are or painful consequences we must bear. Yet this moment of recognition makes Caravaggio’s art compelling. It makes us look—and look again. When we do, we find not only unflinching observation; we also find empathy. We find an artist who meets us where we are. Perhaps this is not surprising since Caravaggio himself led a troubled life. As Elizabeth tells David in the course of their session, at the end of his life Caravaggio faced a murder charge, exile, and imprisonment. He died of a fever before realizing that he had obtained a pardon. Elizabeth’s lover, Thomas, summarizes Caravaggio’s life and work when he describes an artist as “someone who knows he is failing in living and feeds his remorse by creating something fair” (149). In making something fair, Caravaggio makes an uncompromising but not unhopeful observation of the human condition. His figures acknowledge that we need healing—we are David and Mary Magdalene and Paul, troubled and grieving and blind. We need the Christ who revealed himself at Emmaus. 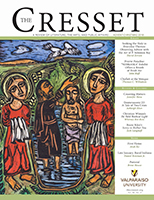 Our greatest journey is to go from the sorrowful Magdalene to the astonished disciples who encounter the risen Lord: we raise our head, recognize the truth, and we can go on. David and Elizabeth go on. They raise their heads and encounter truth—the truth of what happened in the past, the truth of who they are today. 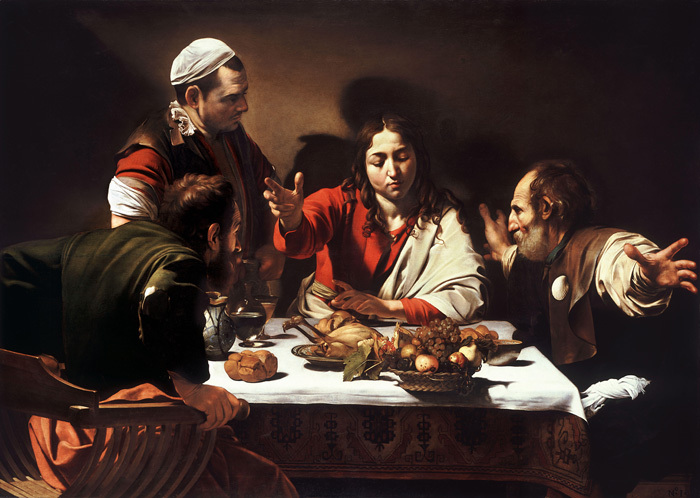 The novel takes them to their own Emmaus; in this way, it is a retelling of the story in the Gospel of Luke, as is the Caravaggio painting that propels the novel’s plot. In Luke’s story of resurrection and revelation, Vickers finds symbolic meaning for her own characters’ journey. The final section of The Other Side of You takes David and Elizabeth past Emmaus and lets them reflect on the outcome of their journey. David goes to Rome, where he delivers an address at an international psychiatry conference. He decides to forego a more traditional talk in favor of recounting his session with Elizabeth, including the role that Caravaggio played. In his talk, he notes that, of the four Gospels, only Luke tells the story of Emmaus. Luke is traditionally known as a physician. As a doctor himself, David feels kinship with Luke and intimates that the Emmaus story is a kind of case study—an account of a healing. David does not mention that Luke is also the patron saint of artists. (Historically, painters in Italy belonged to the guild of physicians and pharmacists, perhaps because both doctors and artists ground their own materials.) Vickers’s novel implicitly shows the connection between the two sides of Saint Luke: art and healing. As her characters find, art shows us who we are—we are travelers on the road, lost, grieving, in need of aid. It shows us who we can become—witnesses to truth, a truth that, as someone whose heart is burned by the Emmaus story, I cannot help but identify as the resurrected Christ. When we find him—when we become like the disciples in Caravaggio’s Emmaus painting—we find ourselves. This surely is a form of healing. There is a final resurrection in The Other Side of You. Just before he died, Thomas was on the verge of discovering what he hoped was a lost painting by Caravaggio—a Road to Emmaus. (This fictional incident mirrors the real-world announcement in 2006 that a third Supper at Emmaus by Caravaggio was discovered in France.) On the heels of death, a resurrected Emmaus painting speaks of hope. It avows that the road to healing continues. Elizabeth and David have new journeys to make, new revelations to undergo. As readers who travel our own roads, so do we. As we make our pilgrimage to Emmaus, we are reminded that art—the paintings of masters like Caravaggio and stories like The Other Side of You—goes with us on our way. Bellori, Giovan Pietro, Hellmut Wohl, and Tommaso Montanari. The Lives of the Modern Painters, Sculptors and Architects: A New Translation and Critical Edition. Alice Sedgwick Wohl, trans. New York: Cambridge University Press, 2005.